What’s the Project? 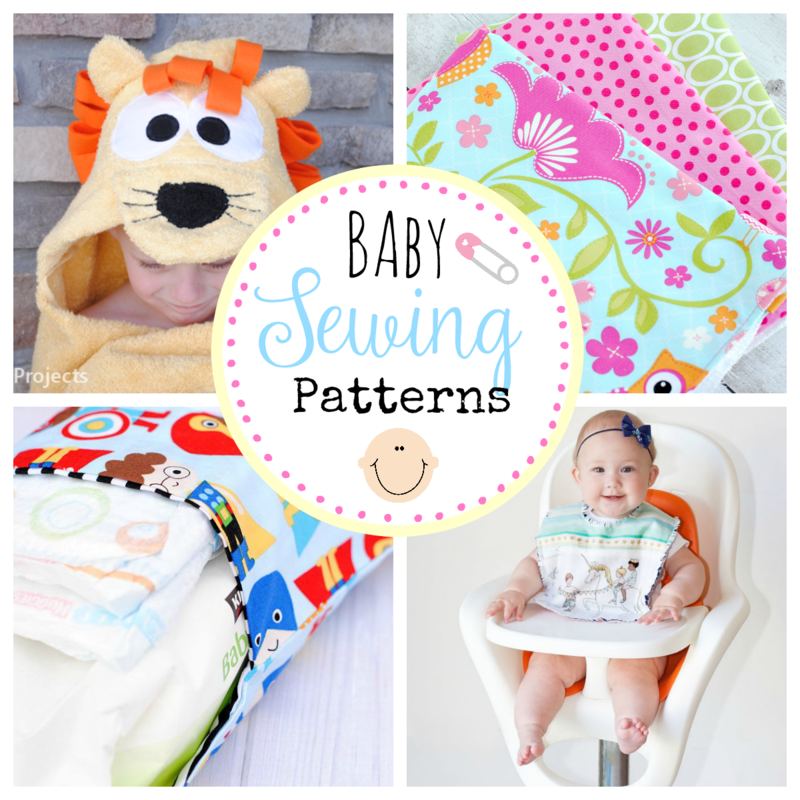 These children’s hooded towels are a perfect sewing project because they make a great gift for babies, toddlers, and kids. 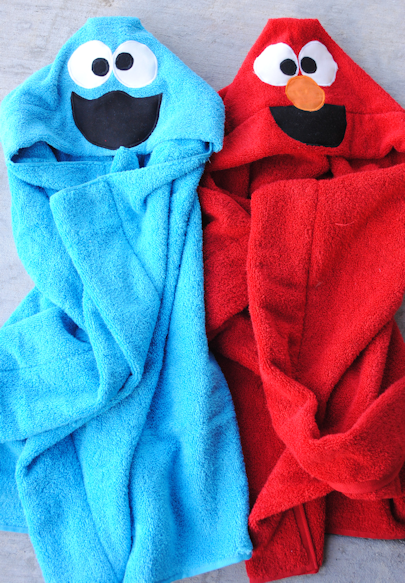 These hooded bath towels are made to look like dinosaurs, minions, animals and other childhood favorites. 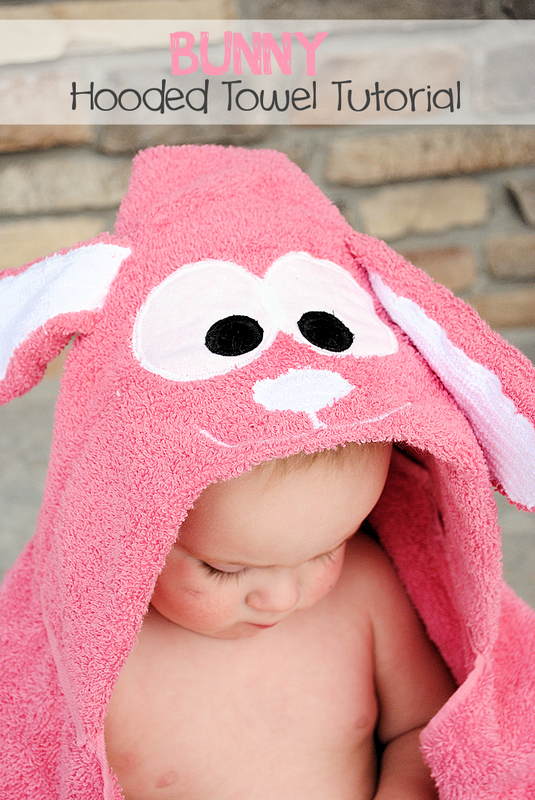 When my babies were little tiny newborn babies, my mother in law made these fabulous hooded bath towels for them. 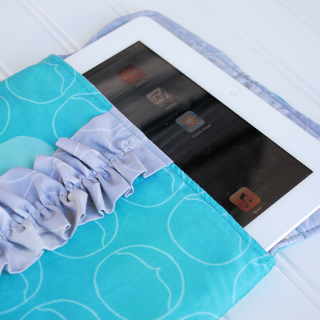 They were made from actual bath towels so they were thick and warm and cozy and perfect! And then she taught me to make them and I made them as baby gifts. At some point along the line, I started putting faces on them. 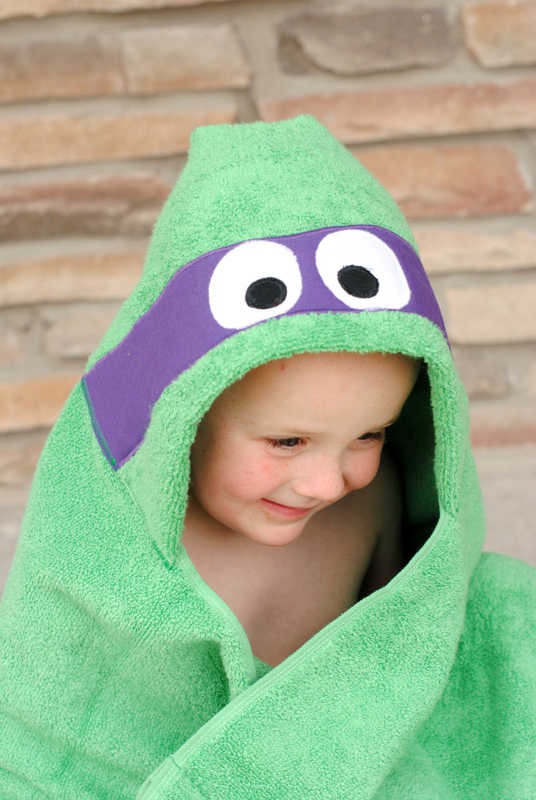 I don’t even remember when or why, and I can’t remember which was first, but I think it was the frog hooded towel. Or maybe the duck. 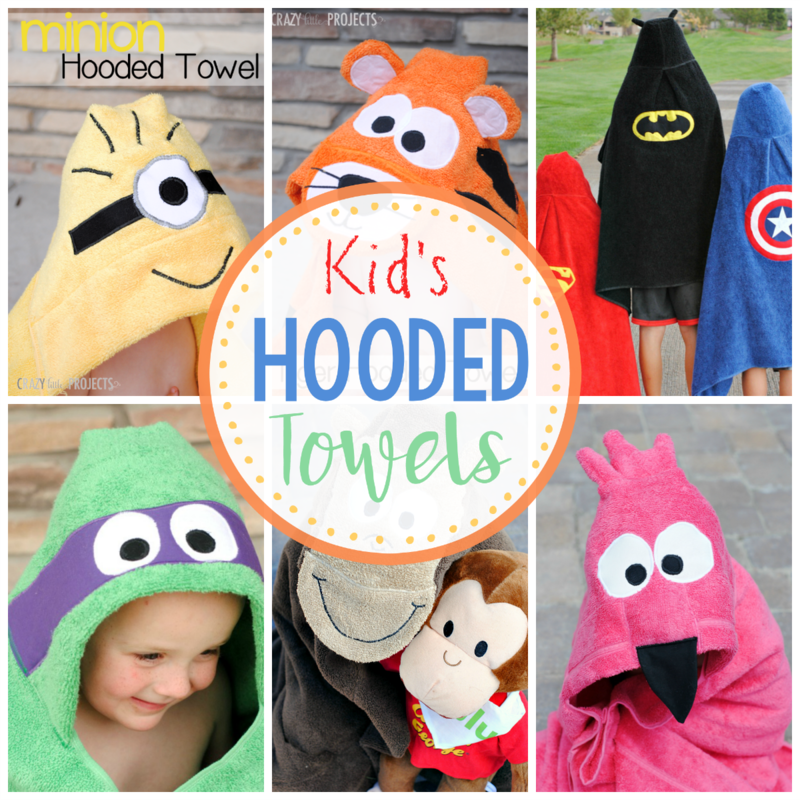 And then I started creating all of the characters and now you can see all these cute children’s hooded towels and make them yourself! Honestly, friends, I can’t even choose which is my favorite! They are just so cute! I love the Minion, the puppy, the owls, the superheroes and so many more of them. Which do you love best? I’d love to hear! 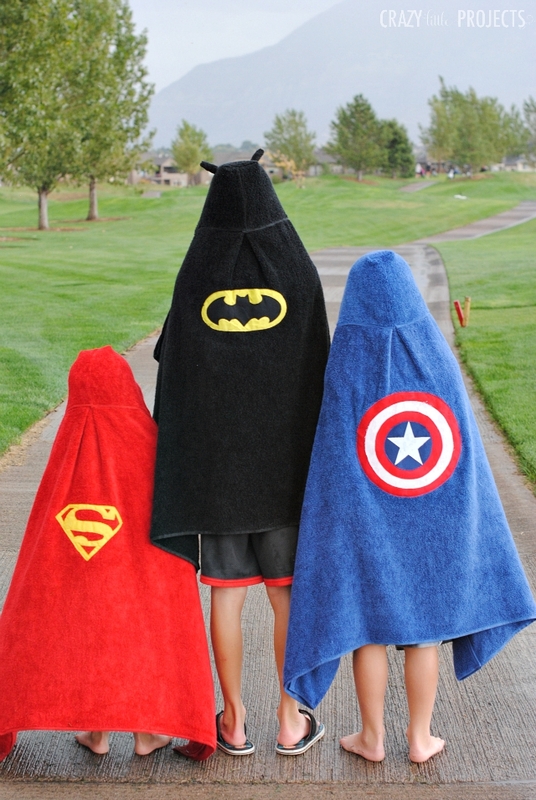 Here’s a look at these great hooded towels. Now, this is just a peek at some of the hooded towels. There are more here as well. 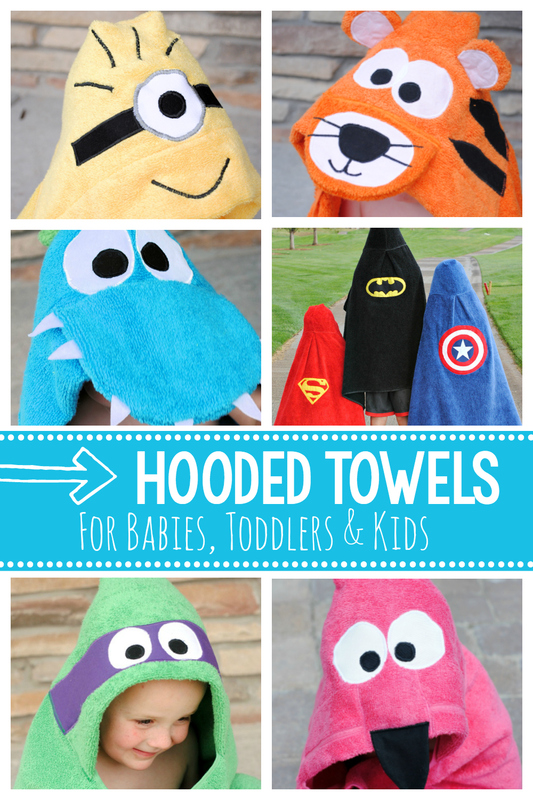 See ALL of the hooded towels here. Yes, there’s more! 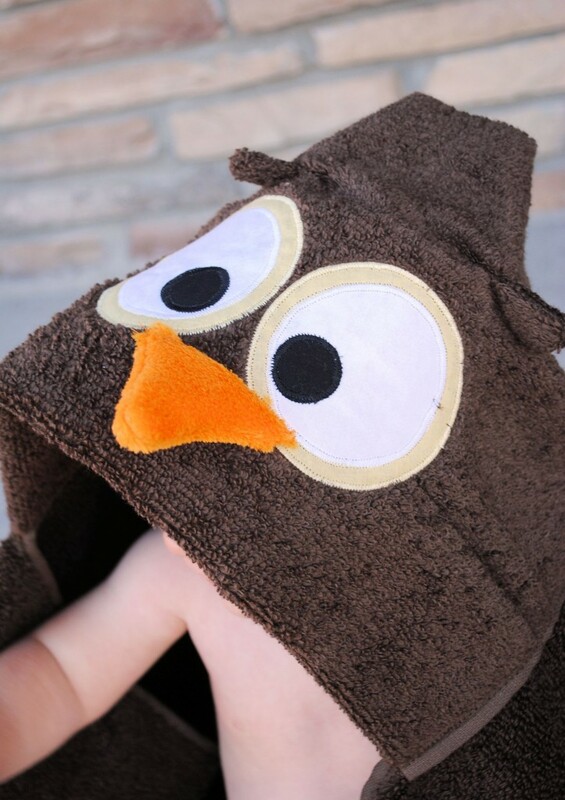 And have a great time sewing these cute children’s hooded towels and giving them to everyone you know! 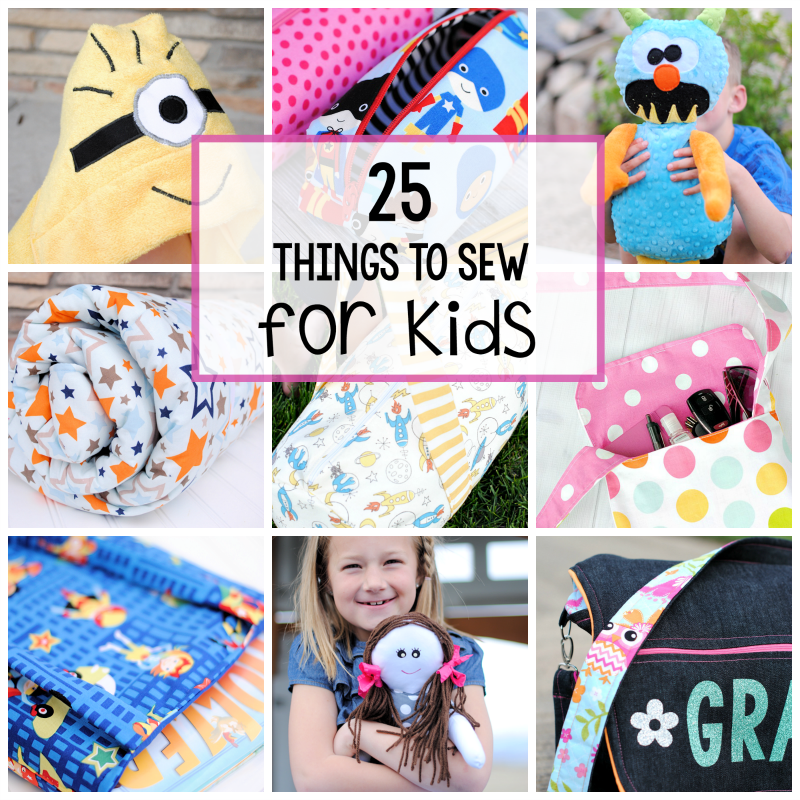 They make such a great baby gift or a fun birthday gift for little kids. They are so fun! OMG!! These are so darn stinkin’ cute!!! I can’t decide which is my favorite!! Loved them. I made all but minnie and mickey. I even came up with a hello kitty one lol. Keep them comming please. 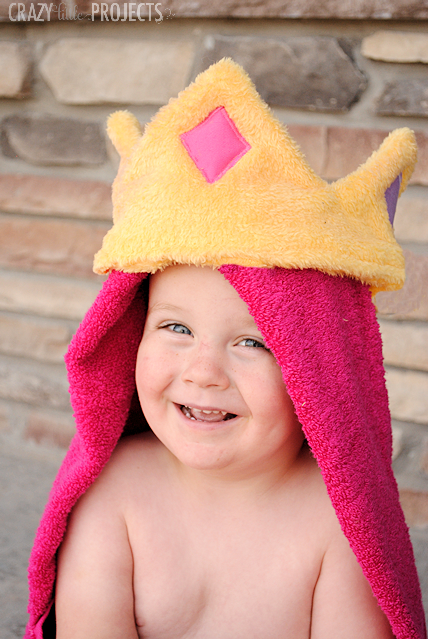 What a wonderful year of hooded towels! I’m looking forward to all your posts in 2014! 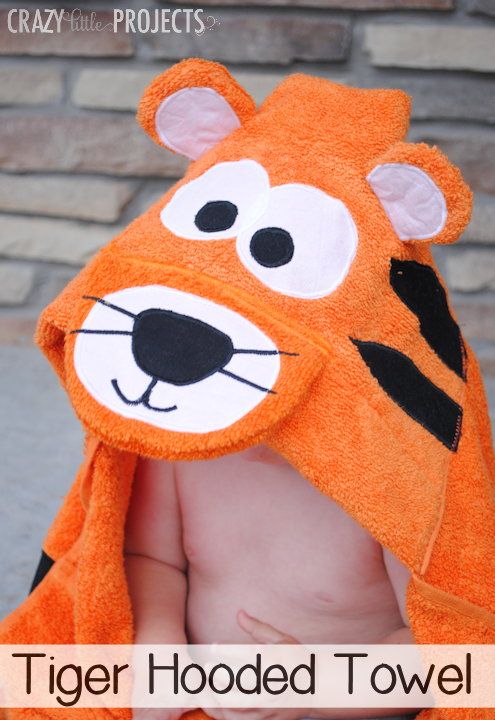 Thanks so much for the hooded towel ideas. 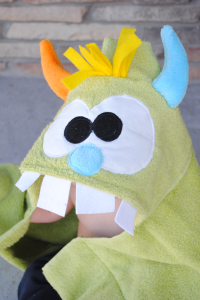 I made the monster ones for my grandsons and they loved them. Again thanks for so many ideas. Oh I bet that was cute!!! Where do you buy your colored towels? I know target sells them cheap but they aren’t very absorbent. Thanks so much! So cute! after all it’s use, it needs to be fixed. Hmmm, that’s a fun idea! I will add it to my to do list. Will you tell me where you get your towels? The colors are so vibrant and the towels look so soft! Love these towels! Thank you for such a fun project! Thank you for sharing these tutorials! 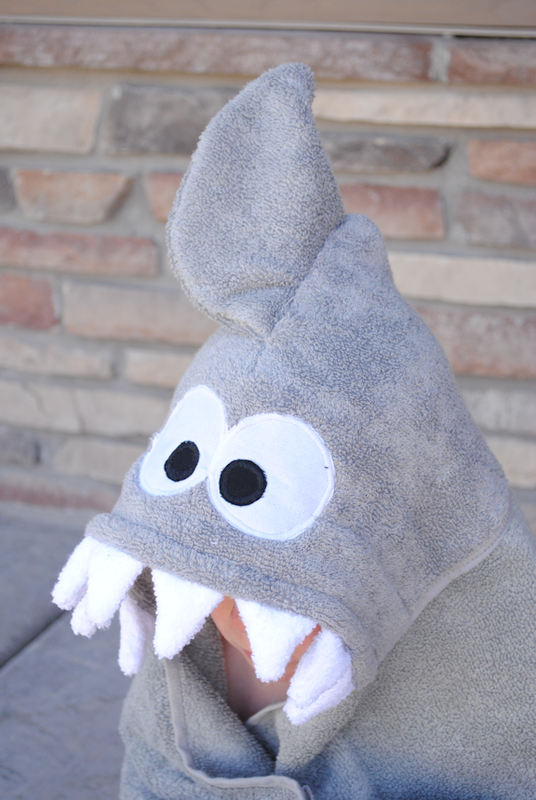 My nephew just celebrated his 1st birthday with a monster themed party so we made him one of the monster hooded towels and we are thrilled with the results. would if you took this (http://kirstyneale.typepad.com/gingerandgeorge/2011/03/dino-boys.html) and made it into a hooded towel? Such talent. Can’t really pick a favorite as they are all just adorable. Hope I am able to accomplish at least 2 of them, or maybe more. 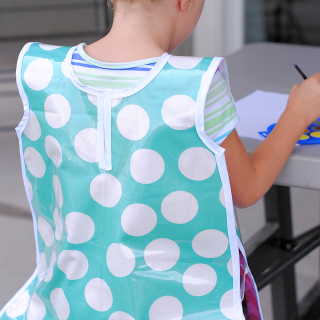 Have many great nieces and great nephews that these would be the perfect gifts for Christmas. Thank you so much for sharing. Thank you so much for these tutorials! 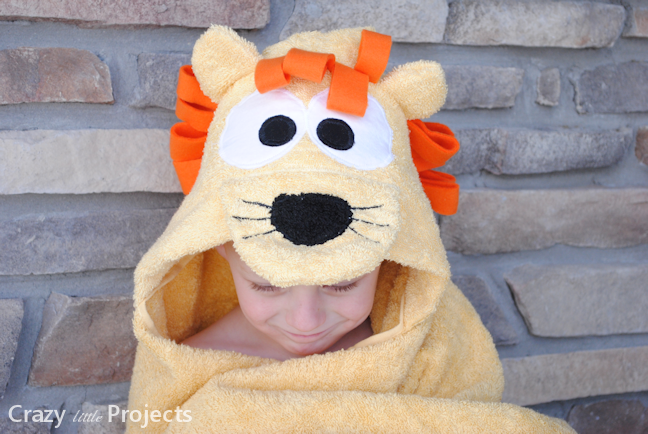 After much deliberation, I made the lion one for my son for Christmas. I’m so pleased with the results. It’s adorable! Your tutorials are very clear and so easy to follow. I will be making more. Thanks again. 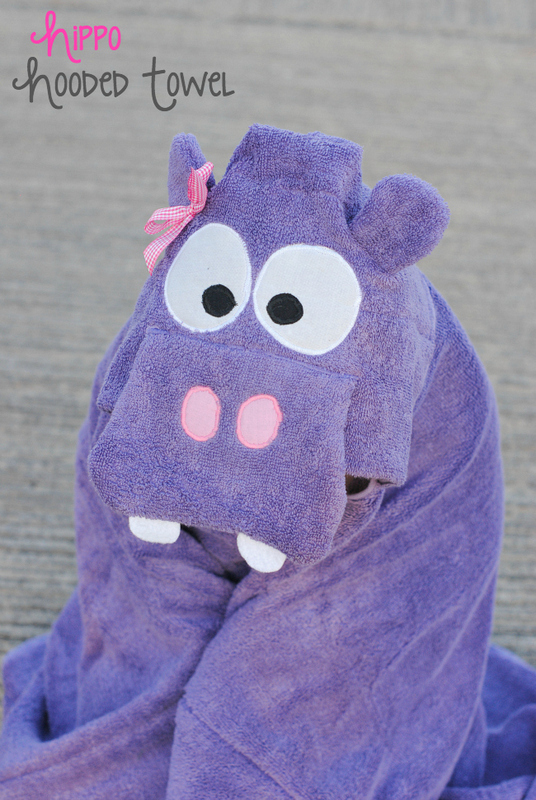 Hi, I love your hooded towels so far I’ve done 2 of them. What great gifts!!!! I know you’re busy but I’m hoping you might help me a little. 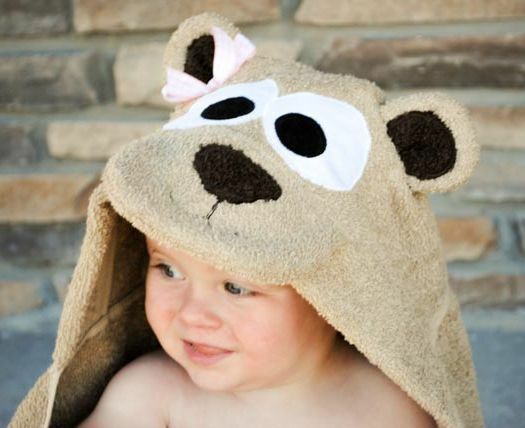 I want to make a horse hooded towel but am stumped with the head and putting a mane down the back of the hood. Truthfully the long head is what has me stumped. 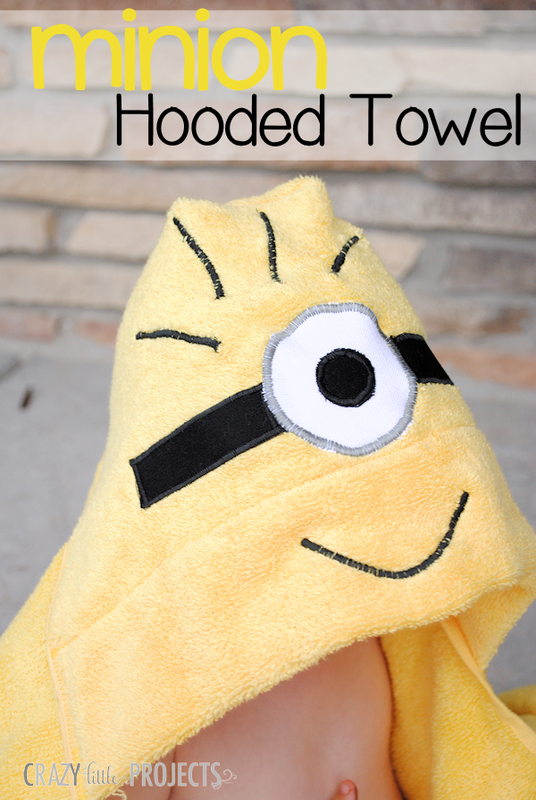 Are you adding any more hooded towels this year? They are the cutest things! I am going to attempt the frog this week. I should. I kind of got burned out for a while, but maybe I could get myself going again. I should make one! I haven’t yet.